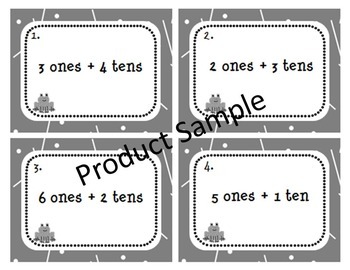 SCOOT Task Cards - Place Value - Ones and Tens - Fun Math Center! Your kids will love Scooting to Learning! Get your kids engaged in their learning with Scoot and they'll love the fun and movement you've brought to their learning! Use Scoot as a quick informal formative assessment to determine which students have mastered understanding of the concept of Place Value using tens and ones in word form. You can also use the Scoot Task Cards as a center activity while you work with small groups of your students who may be struggling with the concept. 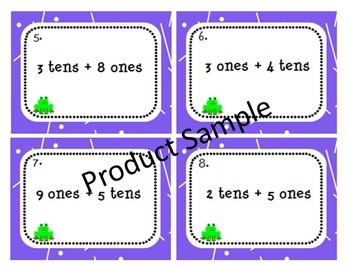 Scoot Task Cards are an engaging way to encourage your students to master skills they need to learn. Your students will love to learn while they play. A card is placed on each child's desk. You determine the amount of time your students need to find the solution for a card and record their answer. When time is up, you call "Scoot!" and all children move to the next seat and begin to solve the next problem. Play continues until each student returns to their original seat. Your students will work with enthusiasm to solve problems they normally don't enjoy! Review their answers and discuss any misunderstandings and your students are on their way to deeper understanding of the concept! Laminate these cards for repeated use to save time! You'll be happy you made your students' day as they SCOOT through their learning! Earn TpT credits by leaving your honest feedback. Be the first to know about my new products, product updates, sales, discounts, and freebies. Look on any page within my store for the Follow Me GREEN STAR located near my store name and logo. Click it to become a follower. Pay it forward and help promote this product by clicking the Pin It button on the top left of your screen.